Whoever gets the job of England coach once candidates have been interviewed this week will have a huge job on his hands, following one of the most traumatic periods in the team's recent history. He must rebuild a side that was humiliated by Australia in all forms of the game over the winter, plot a strategy for success in next year's World Cup and home Ashes series, and present a vision of how he is going to identify potential match-winners for the future. But above all, England's new coach needs to oversee a sea change in the culture of the team. The side that went to Australia were arrogant and complacent. They tried to come across as hard, aggressive and macho, with a win-at-all-costs mentality, but they were nowhere to be seen when the going got tough. Now is the time to go back to square one, to create a culture in which players genuinely recognise the honour of playing for England. Look at the Australians and the way they all buy into the iconic status of the baggy green. England have numbers on their shirts and caps, denoting where they stand in the long list of those who have played for the team. But do the players ever stop to think about what the number means and the deeds of those who have gone before them? 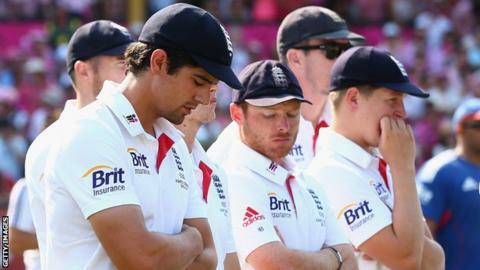 We always hear the players trotting out soundbites about how proud they are to play for England, but I think the true sense of that pride has been lost. I just hope this winter has been a real wake-up call as far as playing and representing your country is concerned. What the team needs now is a good, hard-working, skilful set of players who want to play cricket hard but in the right way. With that blueprint in mind, I'd be surprised if the board did not go for an Englishman to replace Andy Flower and, in my view, I see it as a straight fight between Ashley Giles and Peter Moores. Australian Trevor Bayliss is among the candidates, but I think appointing him would be a knee-jerk measure. Unlike Gary Kirsten, he is not a top-of-the-range foreign coach who would clearly be worth pursuing. He has a decent record with Sri Lanka, Kolkata Knight Riders and New South Wales but is not an outstanding candidate. Nottinghamshire's Mick Newell would bring great county pedigree and is well respected, but I just don't see him as an England coach. That is no reflection on him but I think they are going to want someone who has played international cricket or has good experience of being around the international scene. In many ways, Moores has the biggest card to play. In his first tenure as England coach, he paid the price for not being able to work with Kevin Pietersen. Now he has a free hand and can justifiably argue that he deserves another crack of the whip in this post-Pietersen world. Moores is a very technical and deep thinker, who is very into processes. He would not exactly bring a breath of fresh air after Flower, but he has been around the game for a long time and is highly regarded by the current squad of players. As for Giles, I think it would be unfair for the defeat by the Netherlands in the World Twenty20 in Bangladesh to count against him. It was a huge embarrassment, but these nightmare results happen in T20. The last time England lost to the Dutch - at Lord's in 2009 - they won the Ashes a few weeks later. What struck me in Bangladesh was how far the players and other people in the England set-up really wanted Giles to get the job. Although that is not a reason to give it to him, it does suggest he is pressing the right buttons off the field. Clearly results have not been great, but the teams he has had to choose from have not been the strongest and he has repeatedly been asked to run a one-day series at the fag end of a Test series when everyone is exhausted and switched off. Whoever is given the job next week, I am sceptical whether they will be able to oversee the team in all three forms of the game for a sustained amount of time. The realities of life kick in and it becomes impossible. Flower was originally in total control but gave up the one-day and T20 roles when he was in a strong position after winning in India. No-one blamed him for taking that decision. These coaches are expected to be away from home for unreasonable amounts of time and eventually something has to give.